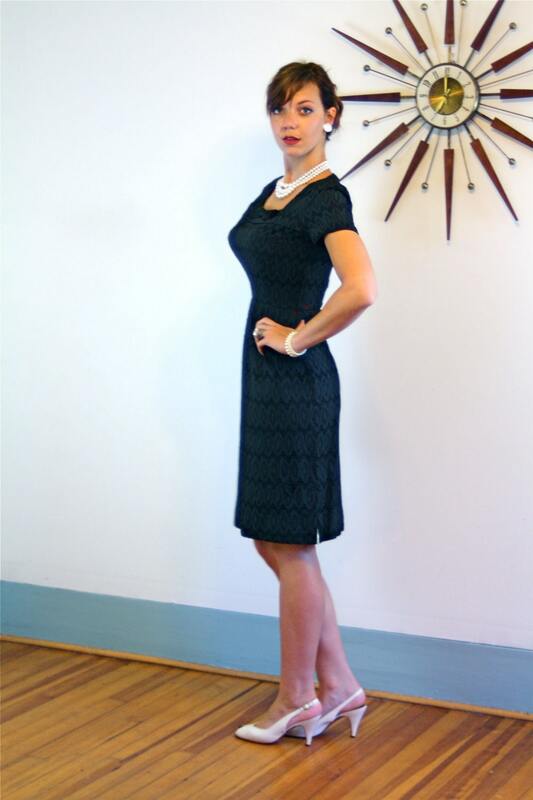 This is the perfect little vintage 1960s black wiggle dress! Made by Ann Colby, this eyelet lace, squared neckline dress is just so hot! It has a little bow at the collar, belt loops, and one pocket. There is a metal zipper at the side. It is the perfect 60s MAD MEN era cocktail party LBD! Model Measurements: bust:34", waist:26", hips:38", height:5'9"
*Model is wearing stuffed 34DDD Bullet bra! CONDITION: Very Good! Slightly faded. One a 1x1 inch tear in fabric, but there is lining behind it, and it can be re-stitched. There is also some slight fraying at the zipper.